Hopefully the first of many!! 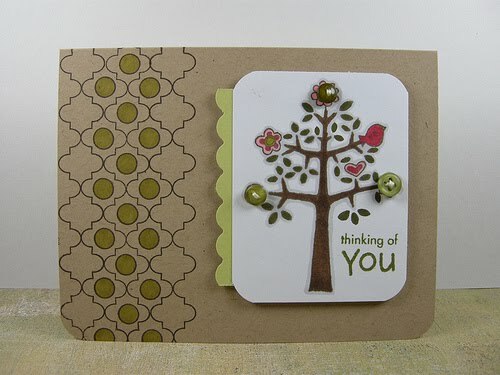 I am also celebrating because, to my shock and amazement, one of my cards was chosen as a top 5 bloomer on Poppie Paperie's challenge #2. This card was made for not 1 but 2 challenges. 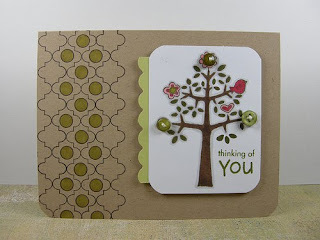 For the CAS #58 colour challenge (green & brown) and for poppy paperie challenge #2 (button, green & polka dots). The background is PTI from the retro backgrounds, image is unity & sentiment is hero arts. Thanks for sharing this exciting day with me!